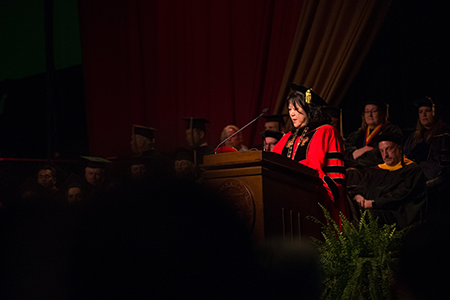 Tapping into both the spirit of music and the rhythm of the spoken word, the inauguration of Ellen Junn as Stanislaus State’s 11th president filled the air with hope and happiness. Music greeted the honored guests entering Fitzpatrick Arena, with the Ballet Folklorico Anahuac — a Hispanic folkloric dancing and percussion troupe — providing a reminder of the strong sense of community and cultural pride at Stan State. And gospel music, performed by the Modesto Christian Center Choir, ushered out the guests as a statement that all creeds and religions are welcomed and embraced at Stan State, one of the CSU system’s most diverse campuses. The inspirational beauty of the spoken word was shared by all who spoke during the ceremony, notably the resounding call to action presented by U.S. Poet Laureate Juan Felipe Herrera, who urged all to use each moment as a starting point for hope and progress. And after receiving the Key to the City of Turlock from Mayor Gary Soiseth and the Presidential Medallion from CSU Chancellor Timothy White, Junn used the platform to address five areas of growth that will be the hallmark of her service at Stan State. The season of inaugural events has been built around the theme “Embracing Student Success, Advancing the Region,” and Junn used the essence of this theme to construct a core idea “Imagining the Future,” which became the springboard for five distinct visions and goals for Stan State. Junn spoke of the importance of nurturing and supporting a climate of strong, authentic and meaningful relationships between students and the members of Stan State’s faculty, staff and administration. Such connections, she said, foster student success and future accomplishments. Relationships and connections with regional businesses also must be nurtured so that Stan State can anticipate and meet the needs of the emerging regional workforce. Junn’s aim is to ensure that Stanislaus State always fosters in each of our graduates a deep and abiding appetite for learning, no matter how many years have passed since graduation. She said it’s never too late for anyone to reignite the hunger for learning. The payoff of a greater understanding of the world around us is well worth the effort. Junn believes that a college degree is valuable because knowledge of human culture and the natural world equates to intelligent and informed graduates. She would like to see graduates not only instilled with the facts, but have an understanding of how to use them. She wants to make certain all graduates have the ability to interact effectively with other people, which will pave the way for them to become professional leaders. Finally, she believes that it is important for students to understand the need to use their degrees to change the world for the better as a simple measure of social responsibility. Junn said she will continue to encourage, promote and support the creation of an institutional Strategic Plan for Diversity and Inclusion that includes consideration of all aspects of diversity in the curriculum, staff, faculty and student recruitment and retention; campus climate; and external community and board engagement. Junn said the pace of knowledge and discovery tell us that students who enter college in the next few years may enroll in majors that do not yet exist on our books. It then is Stan State’s obligation to better prepare, equip and help our students stay current with technological innovations, which will help them take charge of evaluating and creating better solutions. Junn also reflected on the past with the announcement that the Stanislaus State Reflecting Pond and fountains at our campus’ main entrance will be named in honor of Dr. Marvalene Hughes, President Emerita of Stanislaus State. Hughes could not attend the inauguration, but will return to the Stan State campus in the coming months for the formal naming ceremony.